Menya Musashi's ramen may have grabbed all the headlines but for me, the true gem at Isetan's Eat Paradise is this tiny sushi bar tucked at the back. In fact, I'm rather ashamed to admit that I've yet to even wander to the ramen place. Maybe it's the crowds jostling for a bowl of ramen that has put me off. Walk past the crowds and look for this small spartan space. If you close your eyes and just listen to the voices behind the sushi bar, it sounds like you have been transported to Japan. 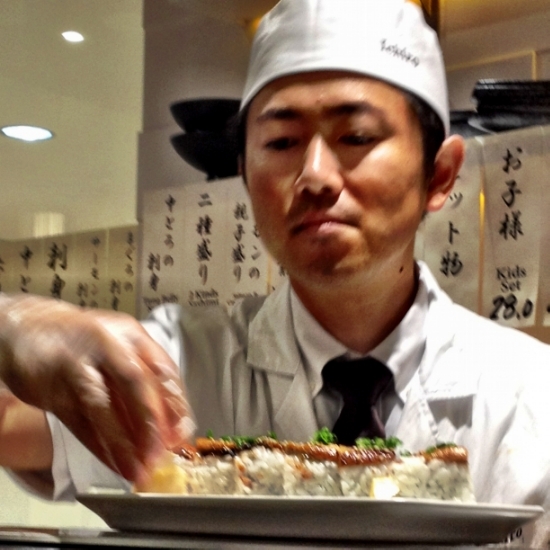 This is because of the four Japanese young sushi chefs that helm the narrow space. 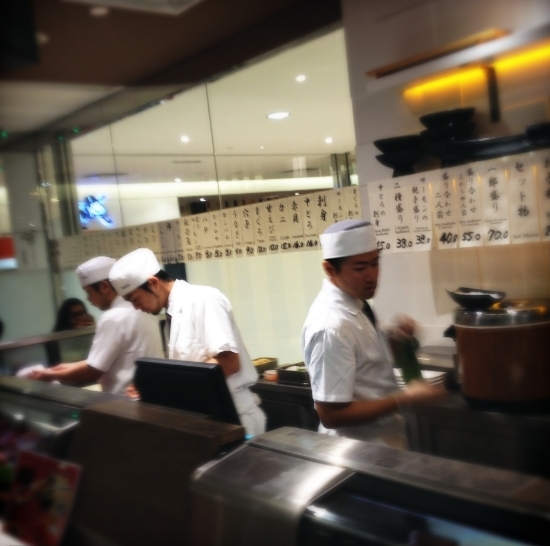 Every time an order is placed, they chatter a dozen away in Japanese to settle the order. Only the waitresses, cashier and one kitchen helper are non Japanese. 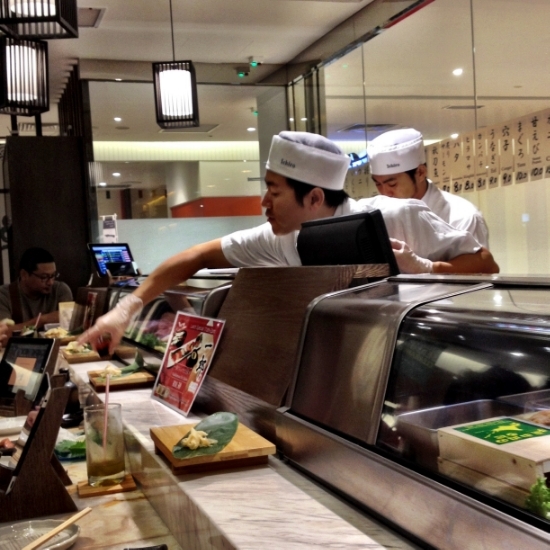 The sushi bar is the best spot for the ultimate dining experience. Here you sit down and see the action behind each order. I love how you place your order vide an iPad on a stand. 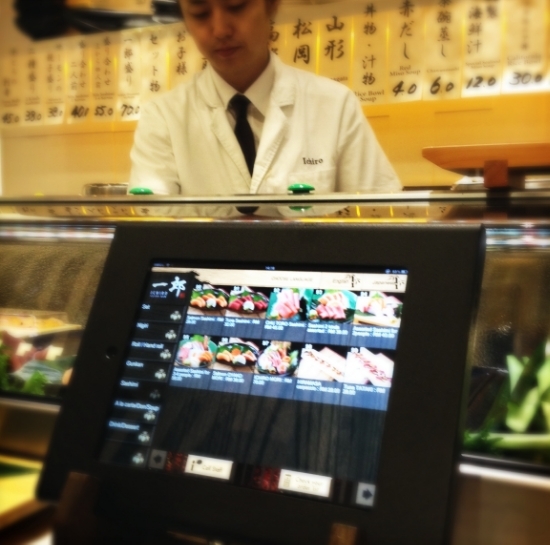 For a truly Japanese experience, you can even view the menu items in kanji, the Japanese language. You can even keep tabs on how much you spend, so you don't blow a hole in your pocket. There is also a nice balance between the modern style as they still stick the paper menu all around the bar. Got to love how they translated the gunkan sushi to "ship" though, which is kinda correct since it resembles a battleship with its seaweed wrap around the rice. The menu is compact and focuses on the fresh fish. 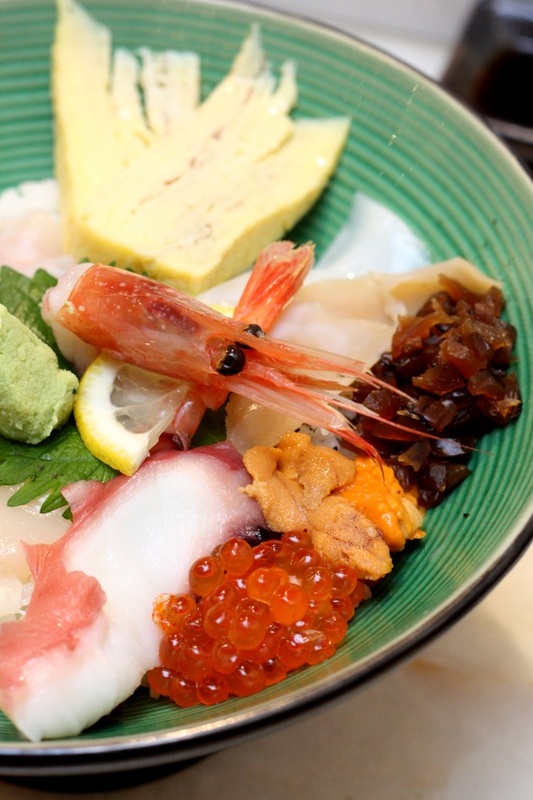 Expect various sashimi items including carpaccio and tataki, nigiri sushi, makis (including the hand ones), gunkan sushi (battleship version with the seaweed), and rice dishes that are topped with sashimi. The cooked food items is limited to tempura, chawan mushi and edamame. They also offer sets with sushi, sashimi, makis from RM28 to RM60. For those sitting on the sushi bar, once you place your order for nigiri sushi, they place a wooden plate in front of you with a piece of leaf. Each time, your order is completed the sushi chef reaches from the bar to place a piece of sushi on the leaf for you to savour. We enjoy the beef tataki nigiri (RM5) and even a chuka wakame one (RM3) that are both good. However, those who were standouts for me, was the sea urchin sushi (RM16) in their soft orange hues and the ikura sushi (RM12), with huge pop in your mouth eggs. My only complain would be the seaweed that encases the rice tends to be quite soft. Not sure if it was already soft or it is because I did wait sometime to snap the pictures. An unexpected find was the sea eel nigiri (RM9) with its sweet flavours and delicate flesh. 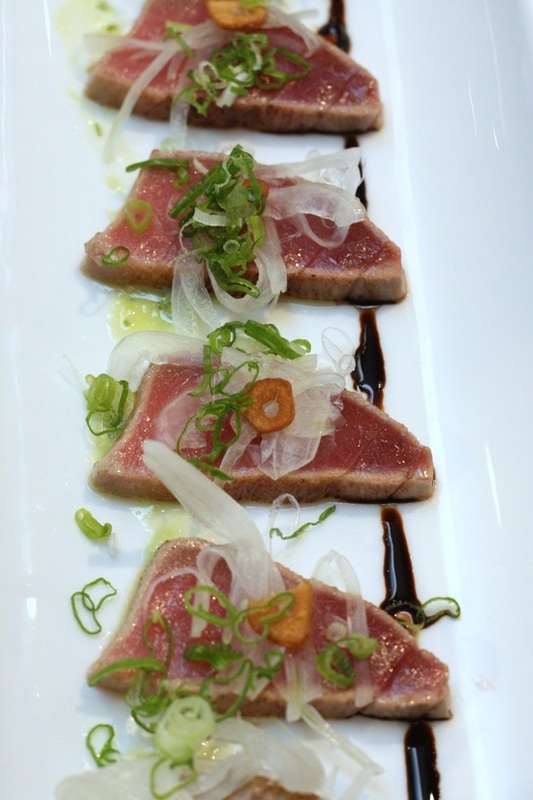 We also enjoy the tuna tataki (RM28), soft tuna pieces with a sweet thick sauce on the side. 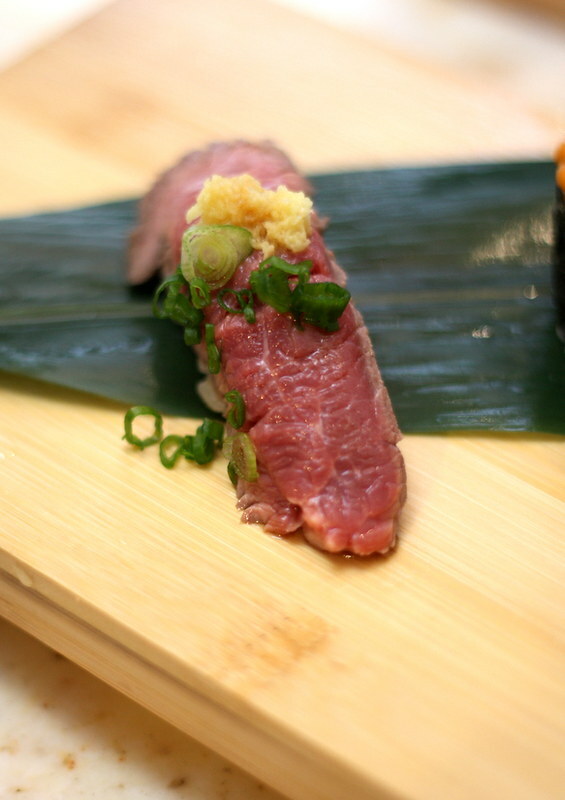 On another occasion, we also try the chutoro, that is fresh and silky soft. There's really no need to reach out for extra wasabi to dip as each piece is beautifully crafted with just the right amount of wasabi in the rice. Just dip the fish side in your soy sauce, place in your mouth and savour the flavours. I'm always partial to chirashi sushi and their Kaisenchirashi (RM38 with a bowl of red miso soup) is exceptional since they give you uni (sea urchin) and ikura (salmon roe) in the same bowl, something other Japanese restaurants don't usually do. I also liked the generous portion of kanpyo pickles on the side that goes well with each glistening rice grain. And, I'm so glad they did not add sakura denbu, the bubblegum pink sweet fish powder. In addition, the vinegared rice is topped with salmon, scallop, tamago, tuna, octopus, amaebi (sweet shrimp), sanma and mirugai. Unlike the atypical Japanese restaurants, they serve red miso soup here versus the pale brown version. This means, the soup has more depth with the rich dark soybean paste. Sometimes this means it can be saltier too but this visit seems to have indicated they have adjusted it to our local tastebuds as it was not very salty. I've read about the slightly firm chawan mushi (RM6) but for me, I felt the texture was fine. It was a nice balance between smooth and those with too much liquid. You will also notice a difference in the green tea served here. Instead of the brew sitting in the teapot for a long time, it is brewed per cup hence you get a strong tasting version. You get a choice of hot or cold (RM2, with free refill). The makis, may look a little untidy or haphazard to some but I like it's soft shape as it means the rice can unfurl in my tongue better. 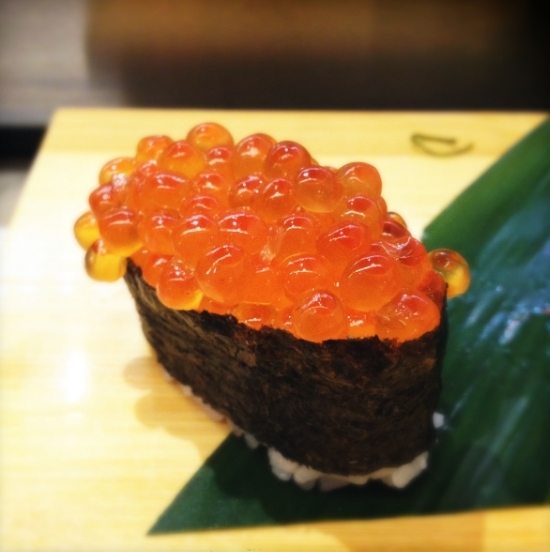 Some sushi chefs tend to compress the rice too hard that it ruins the texture for me since it becomes a lump. Here, even though the rice looks like it's going to fall apart on my chopsticks, it doesn't and makes it safely into my mouth without an incident. So far, we have only tried two types here: the prawn tempura (RM15) and teriyaki chicken with avocado (RM12). I prefer the stronger tasting teriyaki chicken versus the prawn tempura version that seems a bit mild. In our second visit here, we bump into an old friend. He is a novice to the place but he can't stop singing the praises of how fresh the fish is. It's heartening to know that there'll be an army of people willing to return here again and again. For us, we will definitely return since this place feels like little Japan to me. In the crazy rat race life we lead, I would prefer to chill out here and savour every piece of sushi prepared by the white hatted sushi chef and say Itadakimasu. Another friend of mine also posted photos from his meal at Ichiro and sung praises for the place. Can't wait to go try! Baby Sumo - I think initially, they had some teething problems from what I read from other reviews, but I must admit I've had no complaints. Love the whole atmosphere. Wish they did omakase though. After viewing ur post, for my next visit...gonna try their kaisenchirashi and uni gunkan sushi...thanx ya! hi ulric! LOL, they gave us the ichiroll for the Father's Day special and it looked good too. Yes, I was also surprised at how good the anago or sea eel sushi was. Real tempting as I keep pressing the iPad to try new things. ulric - sorry can't view pictures in your facebook, must be your friend first. 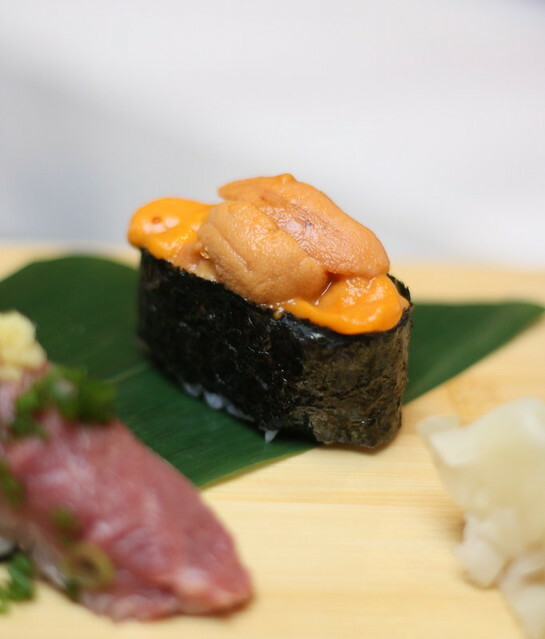 I love that photo of sea urchin sushi, look soooooo yummy! Time to revisit One Utama! 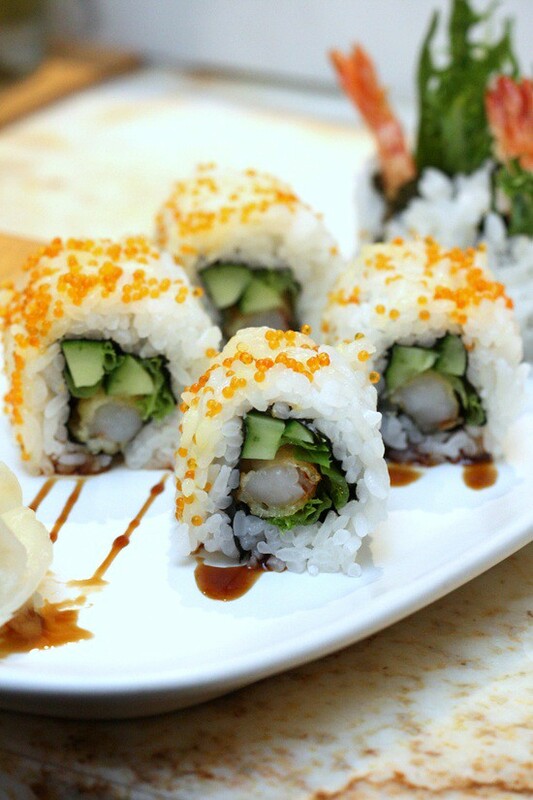 The prawn tempura rolls are making me think that I'm ready for lunch. Yum, this sounds like fun as well as delish. wah this looks like a place to visit sometime soon since I always go to 1 Utama and I don't know what to eat! Can't wait to go try! a friend of mine recommend it highly and I am sure it is great! The first time I went was awesome. I revisited yesterday, it was super crap. Not only you are not given the individual plates on the bar like they used to, the rice of the sushi... I swear even the cheapest sushi from some dodgy supermarket puts it to shame. The rice falls apart even before we picked it up. We requested to have a new one, but the same thing was served. Felt terribly short changed as the sushi are not CHEAP and will never be back for a VERY LONG TIME. Should have went to Zanmai for cheap sushi instead. I have just tried this place tonight and can say the food is overly expensive and the service is terrible. There are much better Japanese outlet in One Utama and PJ generally. We Will Definitely Not Return. Melbourne Restaurants this post is good in regards of both knowledge as well as information. A feature-rich electric pepper mills offered at Peppermills.com. It comes with a 3-year warranty for the first time in the industry.Use it for your spicy food. Visit website:- http://www.peppermills.com! Do you love or like to use those pay software instant of Free Software? If sure you may be like this blog! THE GIVEAWAY BLOG!! is a blog than collect all giveaway software in the day!! What is Giveaway software?It was the original software giving by the company with license with a very limited time to download only!! It's delicious and halal too. Agen bola, bandar bola online, agen casino online, agen sbobet, agen poker, agen bola tangkas aman terbaik dan terpercaya indonesia tidak lupa kami juga memberikan Prediksi Skor Bola, Jadwal Bola lengkap yang akan kami update setiap harinya. dapatkan juga Bonus-bonus menarik setiap minggunya di antaranya adalah Cashback dan Bonus Rollingan setiap minggunya. sports369 adalah bandar bola Terbaik dan terpercaya Indonesia juga akan memberikan prediksi bola jitu dan akurat yang akan kami update setiap harinya. I like this article an excellent article and very interesting to read. Asian gambling real money, free chips for new member, register here!! Bagus sekali itu menurut saya merupakan hal yang tidak biasa dan cukup mudah dimengerti oleh kalian sebagai permain game online server yang cukup menarik. Kami menawarkan banyak kelebihan kepada anda sebagai penawaran permainan online kami. Dan anda anda merasakan permainan game online sesungguhnya ditahun 2019 hanya bersama kami agen game online terbaik. Amazing Blog! Your Blog recipe is very easy to cook. Your Article is very informative and I felt quite interesting reading it. Thanks for posting such post and waiting for more in future.